While scaling still has a place, existing technologies hold the power to push computing in new directions. Whenever a company announces a major strategy shift and restructuring, such as pivoting away from 7nm FinFET technology development, it’s understandable that confusion, uncertainty and misunderstandings may arise. The best way to allay these concerns is to take an objective look at the situation: Demand for chips for the automotive, IoT, mobility and data center/wireless infrastructure markets is growing strongly. That opens up many new opportunities to leverage existing, proven technologies by tailoring, or differentiating, them specifically for these markets. In addition, many potential clients in these areas are startups or non-traditional firms that can benefit from different service offerings. Stepping off the hugely expensive FinFET scaling treadmill allows for better pursuit of these opportunities. 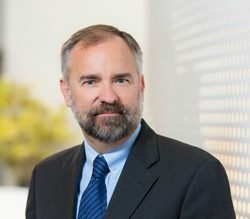 Dr. Gary Patton, GlobalFoundries’ Chief Technology Officer and Senior Vice President of Worldwide Research and Development, explained these industry dynamics and discussed GF’s technology strategy in a keynote talk recently at the Global Semiconductor Alliance (GSA) Silicon Summit East 2018 forum in Saratoga Springs, NY. I sat down with him afterward to learn more. Gary Dagastine: For decades progress in electronics has depended on making transistors smaller to increase the speed and processing power of integrated circuits. What has changed? Gary Patton: Scaling does still have a place for chips used in high-performance computing, but elsewhere the benefits to be gained by following Moore’s Law are diminishing as scaling costs escalate. That doesn’t mean innovation is finished, though. The good news is that existing technologies are now so powerful that by adding new features to them and combining them in various ways, new architectures and ways of computing are possible. What’s really happening is a shift is taking place, from a general-purpose computing approach to a more industry- or domain-specific one. Dagastine: How are you taking advantage of this shift? Patton: Very successfully, given that a majority of our revenue already comes from differentiated offerings. 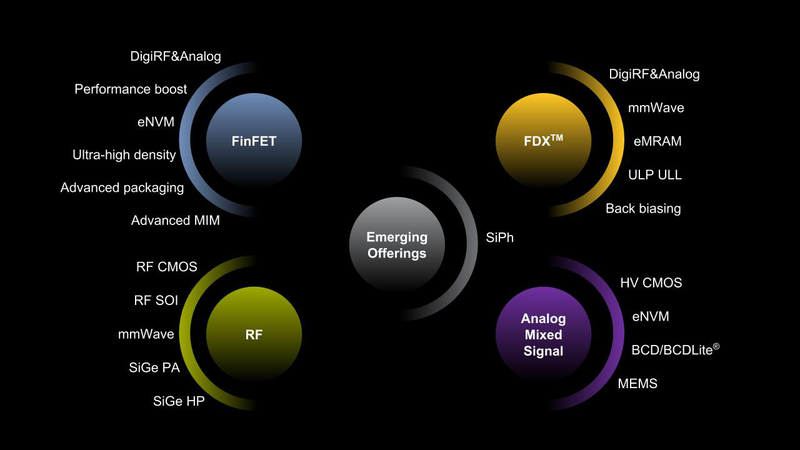 What we call the four pillars supporting everything we do are our FDX, FinFET, RF and power/analog-mixed-signal (AMS) technologies. Our FDX technology is purpose-built for today’s power-sensitive applications, offering low active and standby power yet with the density and performance needed. It offers unmatched RF performance for always-on connectivity, low latency, and higher data rates to help make RF-driven IoT a reality. There is a lot of interest from clients designing chips for the IoT, especially as IoT will make a shift in coming years from WiFi- to RF-enabled. Overall we will have about 20 FDX production tapeouts this year, and we expect that number to more than double next year. In FinFETs, we are realigning our roadmap to serve the next wave of clients that will adopt the technology in coming years. We have shifted development resources to make our 14/12nm FinFET platform more relevant to them by delivering a range of innovative IP and features. For example, for emerging enterprise, cloud and communication applications, we’re working on one-time and multi-time programmable (OTP/MTP) embedded non-volatile memory (eNVM) for ultra-high-security performance. This is based on GF’s physically undetectable and unclonable charge-trapping technology and will make possible market-leading security solutions. They also will offer higher levels of SoC integration. Our NVM solutions require no additional processing or masking steps, and are up to twice the density of similar OTP solutions based on dielectric fuse technology. In RF, GF has a rich portfolio of offerings that align well with proposed architectures and which continue to advance in order to meet 5G and other requirements. RF FDX, for example, enables deep coverage, massive connections and low power consumption for narrow-band IoT, while RF FinFET technology offers excellent scaling and power consumption. RFSOI enables clients to build state-of-the-art LNAs/switches & control function integration for RF front-end modules, phased arrays, and millimeter-wave beamforming. Our various SiGe-based RF offerings are performance-tuned for a long list of low- and high-power applications including automotive radar/lidar, base stations, wired/optical/ mmWave & phased-array communications. By the way, clients are increasingly using our SiGe-based products with CMOS integration to displace the GaAs processes historically used for cellular and Wi-Fi power amplifiers. Our AMS offerings span a wide range of process nodes (180-40nm) and voltages (3–700 volts), offering clients an outstanding selection of functions and price points. Our BCD/BCDLite and high-voltage (HV) technologies are based on GF’s efficient HV CMOS process and include power and HV transistors, precision analog passives and NVM memory for a wide range of traditional and emerging mobility, automotive, IoT and other applications. Dagastine: You mentioned in your talk that advanced packaging is a powerful differentiator. How so? Patton: GF’s high-performance, cost-effective 2.5D, 3D, and silicon photonics advanced packaging technologies support each of the four pillars, and are aimed directly at emerging applications like 5G, networking/base stations, AI/ML and advanced automotive solutions. For example, our though-silicon-via (TSV) technology is well-suited for differentiated uses such as TSVs for RF applications; grounded TSVs for power amplifiers; and isolated TSVs for stacking antennas and/or other passives on RF die (for excellent signal integrity and/or significant size reduction of mobile front-end modules). Also, when implemented through 2.5D and 3D die-stacking, TSVs can allow for reduced latency and power by moving memory closer to logic. Die-stacking can offer significant cost advantages through heterogeneous die partitioning and function re-use like splitting I/O, logic, and memory functions into smaller, lower-cost die using stacking package architectures versus traditional monolithic 2D design. With regard to silicon photonics (SiPh) ICs, we have both fiber-attach and laser-attach packaging technology that will be offered through GF’s SiPh foundry offerings. We have been executing qualifications of our advanced package offerings with major OSATs. For 3D packaging, we will support multiple thermal solution options at the OSATs depending on the product thermal needs, I would also like to point out that we have developed test technology for all of our advanced packaging solutions to help clients become familiar with them and speed their projects. Dagastine: What would you like to say about GF’s research activities now that the company has moved away from extremely scaled CMOS? Patton: First of all, there was a perception that we were entirely focused on leading-edge research, or that it was the only research that really mattered to us, but that simply wasn’t the case. We have always conducted R&D to bring new features to our existing offerings, to add new capabilities, to increase their performance and/or to decrease their cost. Our FinFET technology provides a good example. First, we successfully integrated a MIM capacitor in the interconnect, which resulted in a 10% performance improvement. Then, we developed new IP libraries and achieved a further 5% boost. Right now we are enhancing the RF capabilities of these proven devices with an eye toward the rollout of 5G. With the GF pivot, our research focus is to move more aggressively to differentiate our proven technologies—in effect, to create derivatives of them which enable new applications—to address the new opportunities we’ve been discussing. Dagastine: Where will this work take place? Patton: We have a large R&D group in Malta whose focus is on differentiated CMOS technology development. Our team in East Fishkill works on silicon photonics, RF and packaging technology, key areas of differentiation for us. In Singapore we have a significant ongoing R&D effort in differentiated power and RF technologies at 40nm and larger nodes, while Burlington is where our industry-leading RF solutions are developed. We continue to collaborate with universities across the world and participate in industry research consortia such as imec, Fraunhofer and IME on a range of topics aligned with what we see as our best market opportunities. Patton: A company is only as good as its people, and I am very proud of our track record of first-time-right client tapeouts across our world-wide fabs. That’s not easy to do with such a complex set of technologies, and is a testament to the talent, professionalism and diligence of our colleagues and engineers. Gary Dagastine is a writer and marketing communications consultant. He is the Director of Media Relations for the IEEE International Electron Devices Meeting (IEDM). He also is an editor at Nanochip Fab Solutions magazine and has written for publications such as Electronic Engineering Times and IBM’s Think Research magazine. He started in the industry at General Electric, where he provided communications support to GE’s power, analog and custom IC businesses. Dagastine is a graduate of Union College in Schenectady, NY.